I could post more photos of fall color on Kebler Pass but decided to show some of the other subjects we encounter on our little jaunts (like the sheep posted yesterday). Today its an aspen tree that no longer thrives. 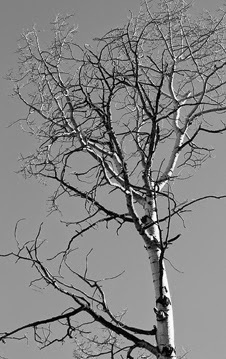 It has many dead branches and was completely stripped of any foliage but I thought it would be interesting to try in black and white. This is the lovely result. Now if a red bird had just perched on one of the branches just before I shot . . . .